Tchaikovsky composed his fifth symphony between May and August 1888 and it was first performed in St Petersburg on the 6th November of that year with Tchaikovsky himself conducting. 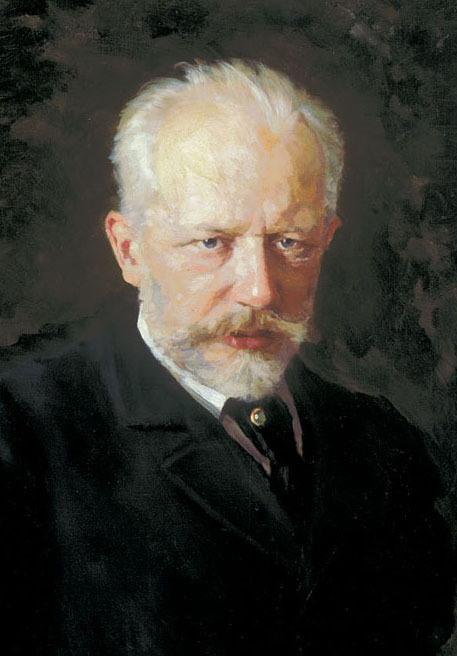 In an entry made in his note book shortly before beginning the composition Tchaikovsky wrote that the subject of the symphony was "Providence". More specifically it is a journey from darkness and despair into light and triumph, accomplished partly by the musical character of the individual movements, and partly through a recurring "motto" theme, which appears in a different guise in each movement. The symphony opens with the motto theme played quietly and mysteriously by the low woodwinds. The composer described this introduction as "a complete resignation before the inscrutable predestination of fate." After this slow introduction the first movement continues with a questing allegro based on thematic material strongly related to the motto theme. It expresses uncertainty and struggle through its shifting harmonies and cross rhythms. There is some respite with a calmer lyrical contrasting section, but it is short lived. The mood of uncertainty dominates to the end where the music fades away finishing with the eerie, sinister sound of the Bassoon playing its bottom note. The second movement in contrast is highly introspective and filled with nostalgia and longing. The first theme is played at the outset by a solo horn in a moment of expressive beauty. A second theme lyrical theme is introduced by the oboe and developed into a a huge lush orchestral climax whose lyrical flow is suddenly threateningly interrupted by the motto theme. The calm lyrical mood returns and develops again in a similar soleful manner but again the motto theme returns on the trombones to dispel the mood of nostalgia, and the movement, like the first, fades into nothing. The third movement seems to breath a new life into the work. It is in ternary form with a delightful waltz forming the first and last section, and a busy semi-quaver passage forming the middle section. In many ways the movement is strongly reminiscent of Tchaikovsky's ballet scores, filled with lively rhythmic ideas and beautiful orchestral touches. The motto theme returns right at the end this time like a fleeting memory. The final movement brings the symphony to its triumphal conclusion. It starts with a long slow introduction, based on the motto theme, but in the major mode rather than the minor, and taking on a new character, tentative at first but slowly gaining in strength and grandeur. A very fast and dramatic middle section follows, full of drive and energy with a character very similar to the battle scene in the Nutcracker. This gives way to the triumphal march which ends the work with the motto theme played boldy and loudly by the brass instruments. The symphony was not an immediate success. After the Russian première one critic wrote: "The fifth is the weakest of Tchaikovsky's symphonies, but nevertheless it is a striking work, taking a prominent place not only among the composer's output but among Russian works in general." Four years later it received a decidedly cool reception in the United States. A reviewer for the Boston Evening Transcript wrote: "The furious peroration sounds like nothing so much as a horde of demons struggling in a torrent of brandy, the music growing drunker and drunker. Pandemonium, delirium tremens, raving, and above all, noise worse confounded!" Shortly after a New York critic wrote: "In the Tchaikovsky Fifth Symphony ... one vainly sought for coherency and homogeneousness ... in the last movement, the composer's Kalmyk blood got the better of him, and slaughter, dire and bloody, swept across the storm-driven score." Even Tchaikovsky himself had doubts. After the second performance, he wrote, "I have come to the conclusion that it is a failure". Eventually however the symphony became recognised for the masterpiece that it undoubtedly is. The theme of triumph over despair became very popular during the second world war. A legendary performance was given in Leningrad during the siege on 20th October 1941 and broadcast live to London. Despite bombing and shelling all around them the orchestra continued playing defiantly to the end. Tchaikovsky's fifth symphony was performed by the Portobello orchestra on the 24th March 2012, conducted by Anthony Weeden.